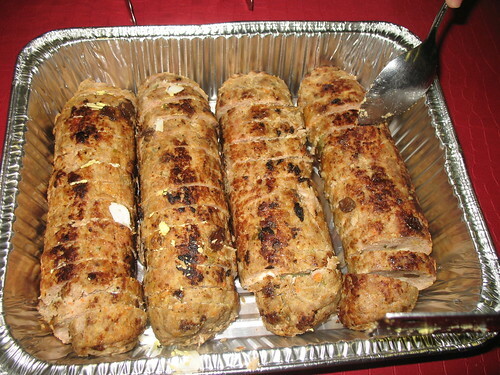 Embutido is a traditional Filipino style of meatloaf, wrapped in an aluminum foil and steamed. This dish is very popular during fiestas, birthdays, Christmas, Noche Buena and many occasions. 4. Arrange the hard boiled eggs on top. 5. Roll the mixture over to form a jelly rod. 6. Roll tightly and wrap in aluminum foil, seal both ends. Repeat with the remaining pork mixture. This can make 2 jelly roll depending on how big /small you want it. 8. Remove from wrapping before serving.